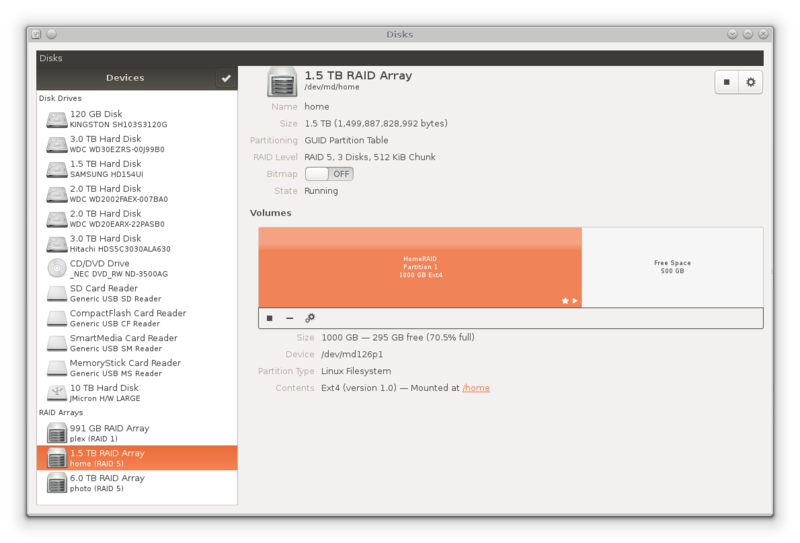 My computer runs a several RAID5 arrays on a handful of drives of various sizes. I recently replaced one of those drives with one of a larger size, which allowed me to add more space to one of my smaller RAID5 arrays. I tried to enlarge the RAID filesystem without rebooting, which should theoretically been possible, but I couldn't make it work. I eventually broke down and rebooted so I could finish the process. Here's the blow by blow steps. First, add the new disk to the machine. Use gdisk to partition it just like the others in the machine. But gdisk still only knows about enough sectors to recreate the original size because the kernel hasn't realized that the "physical" disk device grew. A reboot would fix it, but try though I might, I couldn't figure out how to do it live. I tried various things based on the instruction on the Code Silence and Kernel Hardware web sites, but nothing worked. Have moved second header and partition table to correct location. OK; writing new GUID partition table (GPT) to /dev/md126. The filesystem on /dev/md126p1 is now 244121856 blocks long. The filesystem on /dev/md126p1 is now 366183291 blocks long. So I guess there's no great moral here, and really not even a great instruction set. Sorry about that one. If anybody has any pointers on what I did wrong, I'd love to hear it, as I'm sure this won't be the last time I'll have to try this.